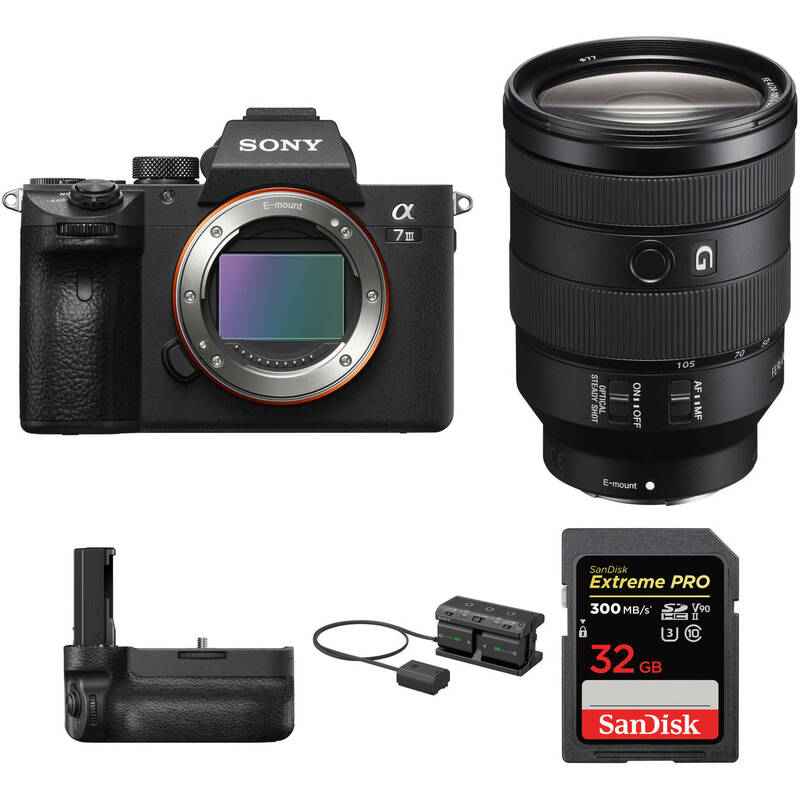 Designed to greatly extend your battery life, the Sony Alpha a7 III Mirrorless Digital Camera with 24-105mm Lens and Vertical Grip Kit from B&H bundles the versatile full-frame mirrorless body and FE 24-105mm f/4 G OSS lens with the VG-C3EM Vertical Grip, NPA-MQZ1K Multi Battery Adapter Kit, and a memory card. Make sure you have plenty of power for your shoot with the NPA-MQZ1K Multi Battery Adapter Kit from Sony. Able to work with cameras that accept NP-FZ100 series or NP-FW50 series batteries, this adapter is able to supply power from up to four NP-FZ100 series battery packs for dramatically extended shooting times. It can also serve as a rapid charge, with a charging rate of 480 minutes for four batteries. Users can convert the adapter into a more compact two-battery adapter for a more travel-ready kit. The NPA-MQZ1K can charge other devices as well via its two USB ports. It also is equipped with a three-level LED indicator light for checking charge status along with six 1/4"-20 mounting sockets for mounting to various support systems. Additionally, it comes with NP-FZ100 battery packs to help users get started. The 64GB SF-G Series UHS-II SDXC Memory Card from Sony features a storage capacity of 64GB and takes advantage of the UHS-II bus to support advanced DSLR functions such as continuous shutter bursts and rapid shooting, as well as RAW and JPEG captures. This card is also well-suited for video capture, including 4K, 3D, HFR, and Full HD video, and can achieve maximum read speeds of up to 300 MB/s and maximum write speeds of up to 299 MB/s. Thanks to its U3 speed class rating, minimum write speeds are guaranteed not to drop below 30 MB/s. Box Dimensions (LxWxH) 8.5 x 5.0 x 4.5"
Box Dimensions (LxWxH) 7.5 x 5.9 x 5.3"
Box Dimensions (LxWxH) 4.9 x 3.9 x 0.7"
Alpha a7 III Mirrorless Digital Camera with 24-105mm Lens and Vertical Grip Kit is rated 4.6 out of 5 by 406. Rated 5 out of 5 by Danish from Untouchable after 3.0 Update The A7III really is the best all-around camera a person can buy today, and for years to come. Ive owned it for five months now and Ive used it nearly every day with the Sony 2.8 24–70 GM. Many of the photos Ive taken have been for digital publications and print - some making it on the covers of magazines. Ive come back after all this time to write this review because with this 3.0 update that introduced Real-time Eye AF - words simply cannot describe how life-changing this is for any scenario. Imagine every photo you take where the camera instantly focuses on the eye every time, without hesitation, and in nearly any lighting. Battery life is phenomenal - the ability to charge it with USB-C (or micro-USB) is a dream come true. I have no need for a second battery. I just carry a big portable battery and plug it in after a shoot. The only criticism I can give is the menu system - just wish it was more touch-enabled (something I believe could be done in future updates). Also, the auto-white balance could use some adjustments. Working a studio testing the camera out, it changed the tones a dozen times even as nothing changed. I also do video. Admittingly, the IBIS is not as good as the GH5 - largely in part due to the fact that most Sony lenses do not have OIS. However, something is better than nothing, especially in low light.